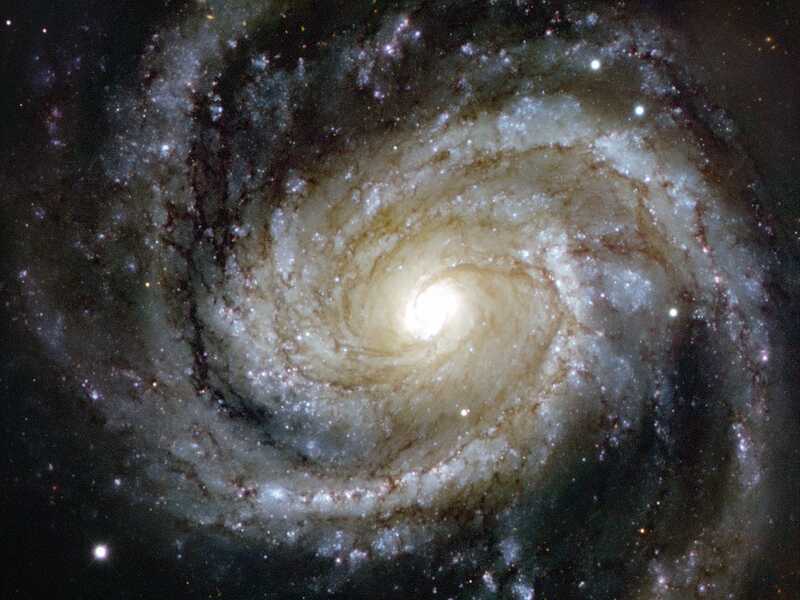 Messier 100 (M100) is a grand design spiral galaxy located in the Virgo Cluster, in the constellation Coma Berenices. 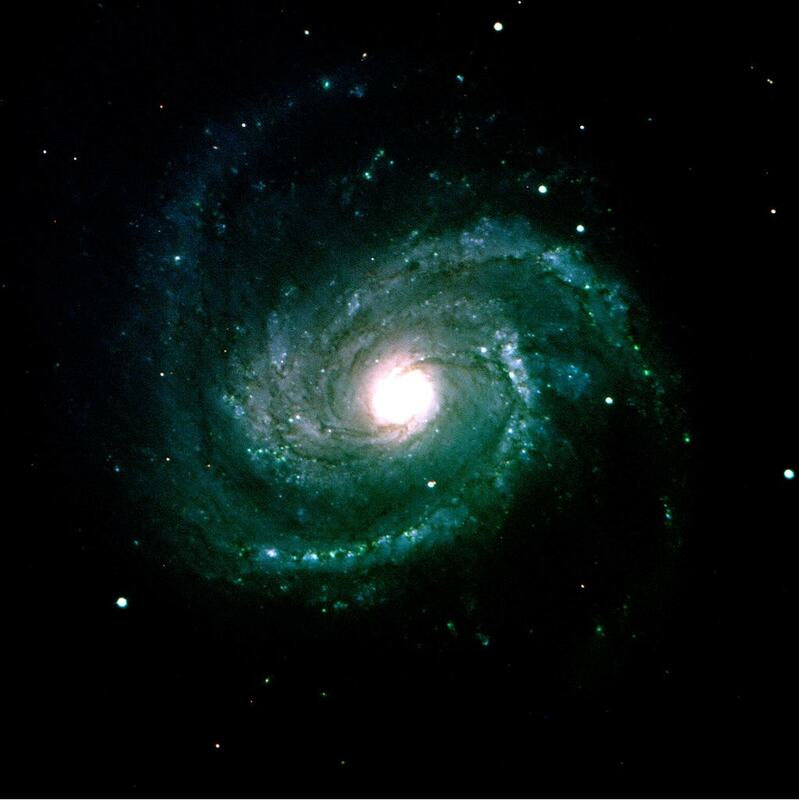 The galaxy lies at an approximate distance of 55 million light years from Earth and has an apparent magnitude of 10.1. Its designation in the New General Catalogue is NGC 4321. M100 occupies an area of 7.4 by 6.3 arc minutes of apparent sky, which corresponds to a linear diameter of 107,000 light years. Located in the southern part of Coma Berenices, it is one of the brightest and largest members of the Virgo Cluster. The galaxy has a relatively low surface brightness and is difficult to see in small binoculars. In large binoculars and small telescopes, it appears as a dim patch of light. 8-inch telescopes show the galaxy’s bright core surrounded by nebulosity. Under good conditions, larger amateur telescopes reveal some of the galaxy’s dust structure. 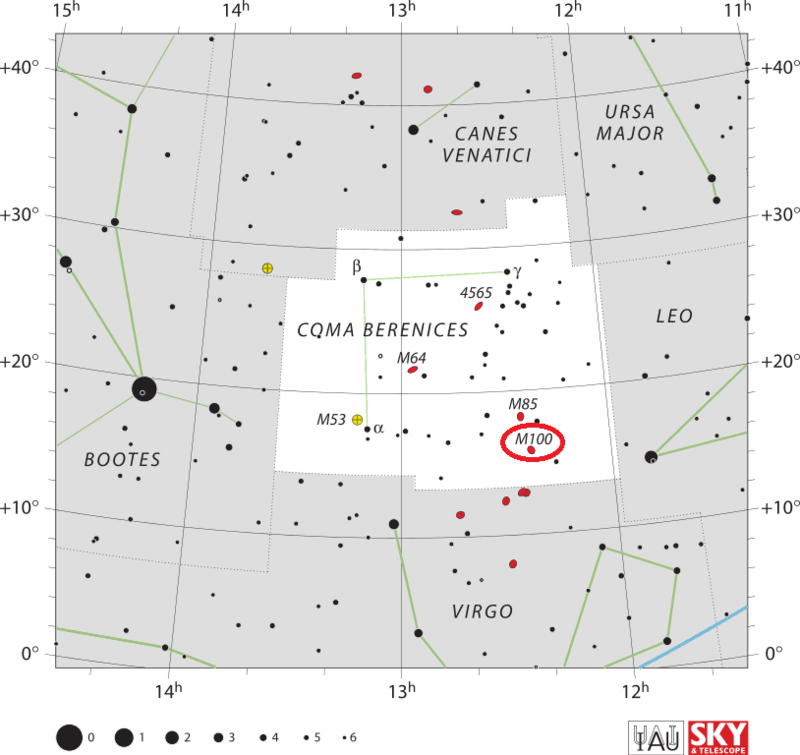 Messier 100 can be found 2 degrees southeast of the magnitude 4.7 star 11 Comae Berenices, north of the line connecting the bright stars Denebola in Leo and Vindemiatrix in Virgo, and slightly closer to Denebola. The best time of year to observe M100 and other galaxies in the Virgo Cluster is during the months of March, April and May. Messier 100 is a starburst galaxy, with strongest bursts of star formation concentrated within a ring in the centre of the galaxy. The ring is in fact two tightly wound spiral arms connected to a small bar with a radius of 1 kiloparsec. Star formation has been taking place in this region for at least 500 million years in several bursts. The galaxy is estimated to contain about 400 billion stars. 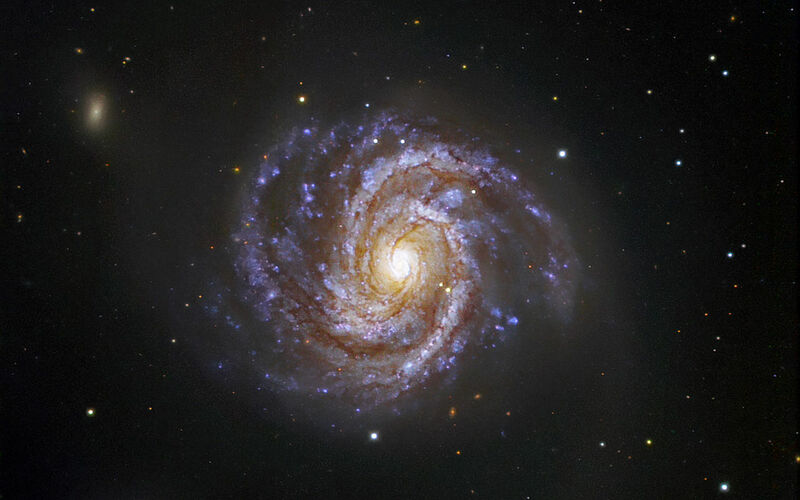 Messier 100 is seen almost face-on. 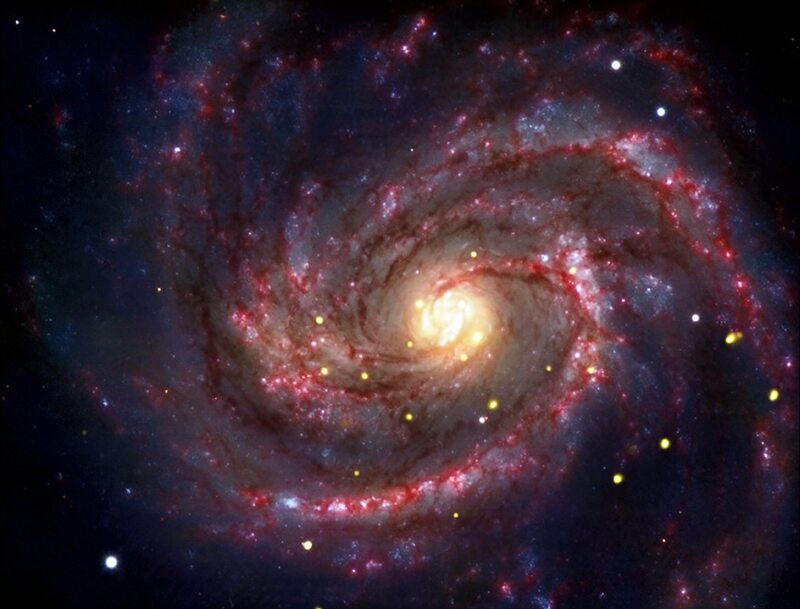 It has two prominent, well-defined spiral arms and several fainter ones. The arms are dotted with numerous star forming regions and clusters of young, hot, blue stars. The southern side of the galaxy contains more young stars, giving M100 a slightly asymmetric appearance. The galaxy is considerably larger than it appears in conventional photographs. Deep images have revealed that a lot of the galaxy’s mass is contained in its fainter outer regions. Like most spiral galaxies in the Virgo Cluster, M100 is deficient in neutral hydrogen compared to similar galaxies that are isolated. As a result, M100 is not showing signs of star formation in the rest of the disk. The galaxy is experiencing ram pressure stripping as it moves through the Virgo Cluster and the process is leaving it without gas. 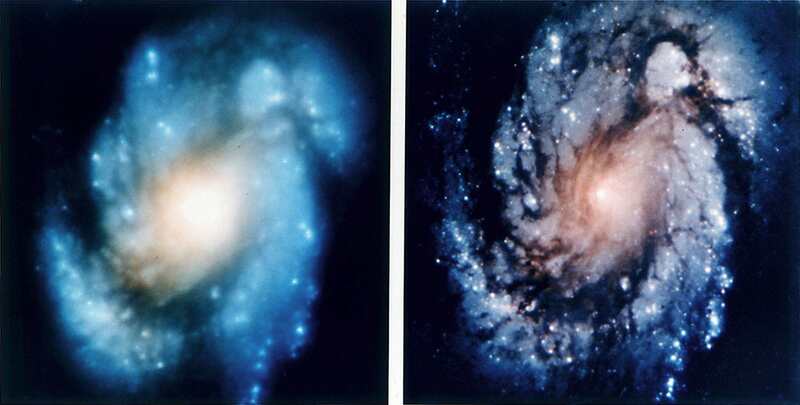 Messier 100 has two satellite galaxies – NGC 4323 and NGC 4328 – connected to M100 by a bridge of luminous matter. Observations with the Hubble Space Telescope have revealed more than 20 Cepheid variables and a nova in M100. The Cepheids were used to measure the distance to the galaxy. Five supernovae have also been observed in M100: SN 1901B (Type I, mag. +15.6) in March 1901, SN 1914A (unknown type, mag. +15.7) in February and March of 1914, SN 1959E (Type I, mag. +17.5) in August and September of 1959, detected in 1960 about 58 arc minutes east and 21 arc seconds south of the galaxy’s nucleus, SN 1979C (Type II, mag. +11.6) detected on April 15, 1979, and SN 2006X (mag. +15.3), discovered on February 7, 2006. Nebula without star, of the same light as the preceding [Messier 99], situated in the ear of Virgo. Seen by M. Méchain on March 15, 1781. The three nebulae, nos. 98, 99 & 100, are very difficult to recognize, because of the faintness of their light: one can observe them only in good weather, & near their passage of the Meridian. A round nebula, pearly white, off the upper part of the Virgin‘s left wing, and certainly at a great distance from Virgo‘s ear of corn, where the Connaissance des Temps places it: indeed, the true site will be hit upon just one-fifth the way from Beta Leonis towards Arcturus. This is a large but pale object, of little character, though it brightens from its attenuated edges towards the centre; and is therefore proved to be globular. It was discovered by M. Méchain in 1781, and is accompanied by four small stars, at a little distance around it; besides minute points of light in the field, seen by occasional gleams. We are now in the broad grand stratum of nebulae, which lies in a direction almost perpendicular to the Galaxy [Milky Way], and passes from the south, through Virgo, Berenice’s Hair, Canes Venatici, and the Great Bear, to the Pole, and beyond. This glorious but mysterious zone of diffused spots, is an indisputable memorial to all future times, of the unwearied industry and indomitable scientific energy of Sir William Herschel. Yet has this unrivalled contributor to knowledge been disparagingly described, as a man indulging in “speculations of no great value to astronomy, rather than engage in computations by which the science can really be benefitted.” Save the mark! This is said of a philosopher of zeal and application hitherto unequalled: one whose contributions to the Philosophical Transactions prove the bold but circumspect grandeur of his conceptions, his consummate mechanical resources, and the exactness of his elaborate calculations. Herschel’s labour, however, transcended those of the ages in which he was cast, although he gave such animation and bias to sidereal astronomy that his mantle was caught at. 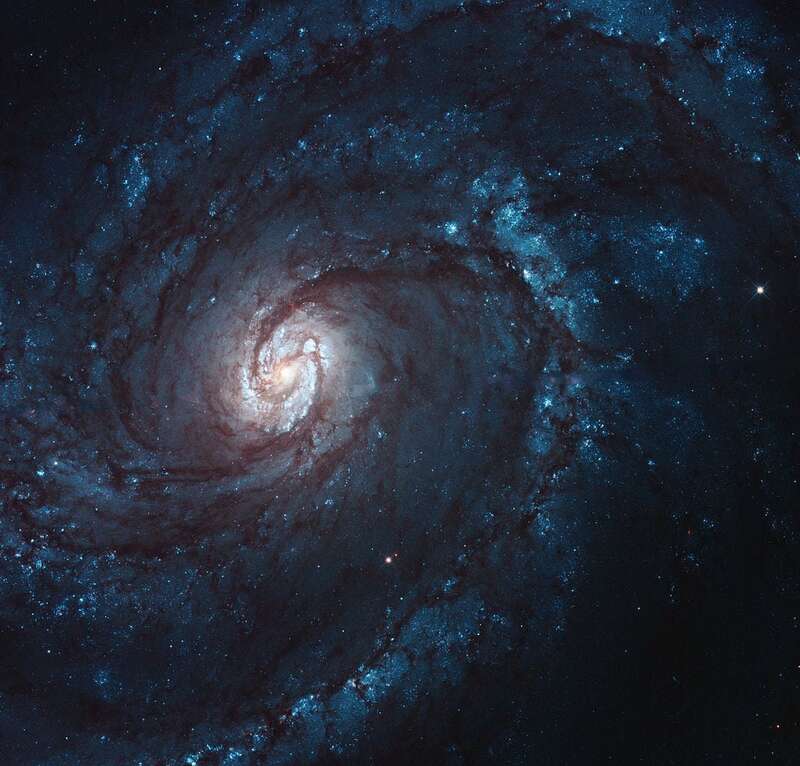 Messier 100 was one of the first spiral galaxies to be identified as such. William Parsons, 3rd Earl of Rosse, included it on his list of 14 “spiral nebulae” discovered to 1850. 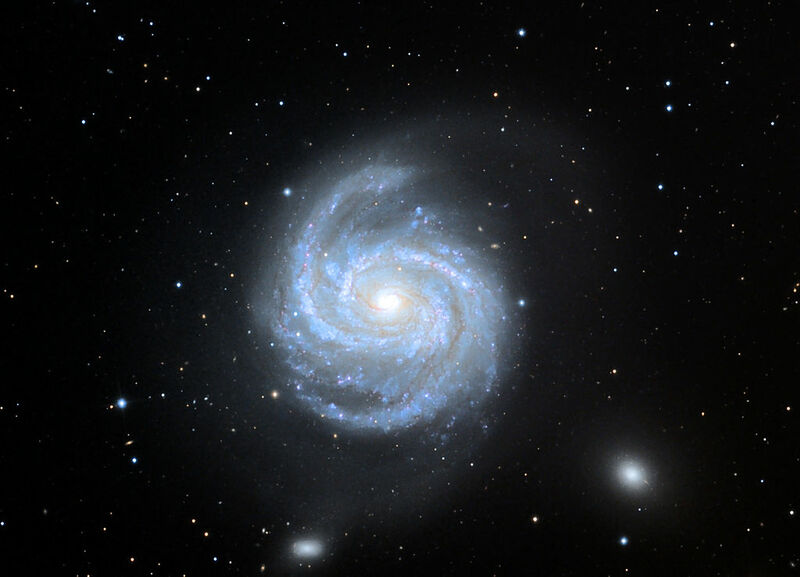 Other Messier galaxies listed by Rosse were Messier 58, Messier 63 (Sunflower Galaxy), Messier 74 (Phantom Galaxy), Messier 77 (Cetus A), Messier 88 and Messier 96. A bright, regular, nearly round spiral 5′ in diameter. Very faint stellar nucleus surrounded by bright, short whorls, forming a central oval. The outer whorls are rather open, quite regular, and show many stellar condensations. Two novae have appeared in this spiral. M. 100. 15 s.n.